Happy birthday Betsy Byars (Summer of the Swans) and Garrison Keillor (Daddy’s Girl; Cat, You Better Come Home). It’s the birth date of Maia Wojciechowska (1927-2002) Shadow of a Bull and Colleen Salley (1929-2008), Epossumondas series. In 1974, Philippe Petit performs a high wire act between the twin towers of the World Trade Center 1,368 feet (417 m) in the air. Read The Man Who Walked Between The Towers by Mordicai Gerstein and Mirette on the High Wire by Emily Arnold McCully. International Clown Week, traditionally the first week of August, wraps up today. Read Clown by Quentin Blake, The Clown of God by Tomie dePaola, and Jake Drake, Class Clown by Andrew Clements. It’s National Lighthouse Day. Read Birdie’s Lighthouse by Deborah Hopkinson, illustrated by Kimberly Bulcken Root, Lighthouse Cat by Sue Stainton, illustrted by Anne Mortimer, The Abandoned Lighthouse by Albert Lamb, illustrated by David McPhail, and the Lighthouse Family series by Cynthia Rylant, illustrated by Preston McDaniels. It’s also Sister’s Day, the first Sunday in August. Read Sisters by David McPhail, Sisters by Judith Caseley, and I’m a Big Sister by Joanna Cole, illustrated by Rosalinda Kightley. Some of our most long-lasting and cherished children’s books celebrate friendship: James Marshall gave us George and Martha; Arnold Lobel, Frog and Toad. 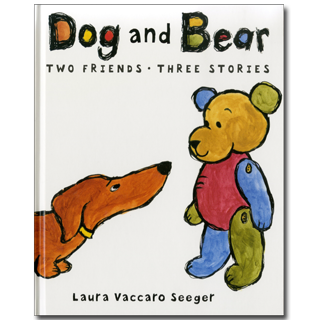 Recently two characters have been created by a talented young author-illustrator that deserves to stand next to these classics—Laura Vaccaro Seeger’s Dog and Bear. Humor and emotion often prove to be the most difficult qualities to create in a picture book since emotion can so quickly degenerate into sentimentality. 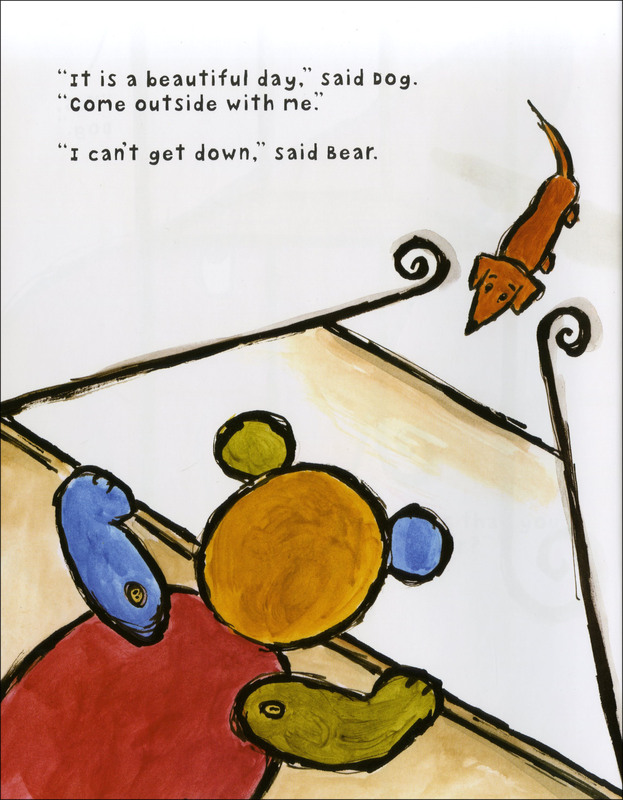 But in Dog and Bear: Two Friends, Three Stories, Laura combines funny stories with a great deal of heart. In the book, she explores the friendship between a stuffed bear and a playful dachshund. Each of the stories contains its own tension and resolution. Every page has a unique design, and the illustrations, with black ink outlines, add humor to the text. Combining simplicity with panache, emotion with graphic brilliance, this saga of two BFF’s can be read again and again with pleasure. Laura Vaccaro Seeger has been an artist since the age of two. By fifth grade knew she wanted to create picture books, but spent time as a television animator before she pursued her childhood dream. One day when editor Neal Porter was visiting her home, he spied a multicolored stuffed bear perched on a tall chair in the living room. Standing there, holding the bear, Neal said to Laura—“Write a book about this!” As she worked on the text, she realized that she based the characters of Dog and Bear on herself and Neal and their working relationship. What children can appreciate in the book are the ways the two buddies help each other and delight in each other’s company. When Bear is unable to get out of the high chair, Dog, a long dachshund, offers his back as a means of transportation. When Dog wants to change his name because it is so boring, Bear helps with the problem. Perfect for emerging readers ages two through six, this book and its sequels, Dog and Bear: Two’s Company and Dog and Bear: Three to Get Ready, bring the concept of friendship alive in the stories of two engaging and wonderful characters. For anyone who wants to see the real dog and bear on which the book is based, Laura’s son created a short film version of the title story. But you can also simply enjoy these books by themselves. Happy Friendship Day, Dog and Bear—you remind us why friends are so precious. Originally posted August 7, 2011. Updated for . One day, I was watching two little girls playing and giggling, and they were just exploding with joy. There’s even a photo of those two on Facebook laughing and brushing each other’s teeth in a mirror. If that isn’t a gift from life, I don’t know what is..
It’s good to have a friend. Gordon and Suzi: Yes, friends are a good thing. And thank you both for being such good friends of the Almanac! I love this book, and I love this almanac. Great pairs! Dog and Bear are good for each other and good to each other…good friends! I love the way Laura gives expression to their eyes! I got to hear Laura and Neal talk about working together at last year’s ALA Pre-conference on picture books. Their session also with David Small and his editor as well as others was fascinating! I’m always so glad to know about new friendship stories that are accessible to early readers. These seem great. Thank you!